I Laugh, Therefore, I AM: Portia the Pianist -- See the Video Here! 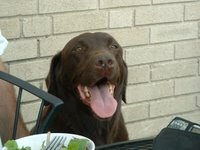 For those of you who have read my previous posts, you probably recall that I'm very fond of my friend's chocolate Labrador, Portia. Portia is probably THE most affectionate, happiest, smartest dog in the whole wide world. She just exudes a lovely, appealing spirit. Anyone who's met her can well attest to that. See her exuding in the pic? What a sweet dog she is. When Portia's owners go out of town on vacation or business, I'd get the dog. We'd have a lovely time, chasing balls, going on walks, having me retrieve her droppings. She really is very smart and, like most Labs, responds very well to rewards. I had taught piano for years, so I tried my hand at teaching her to play. It involved many small steps and lots and lots of treats (raw carrots are her favorite) but she was a very apt pupil. When her owners returned from vacation, Portia was able to perform for them. As you can see, she actually does perform the same song over and over. Next, I'll teach her to play the oboe. Excellent, excellent. She will be at Carnegie Hall in no time. Please amend to read "the most affectionate, happiest, smartest dog in Chicago". Oh. I forgot about the one in Seattle. Oops!